One of the most important areas of Downbelow’s SCUBA diving and travel business is our commitment to conservation and the health of our environment. In an age of environmental awareness there is much to be done in this field and we have lots of exciting programs and initiatives. No truer words have been spoken and these form the base upon which we are concentrating our efforts. Dive Downbelow is committed to designing experiences and providing courses that foster appreciation, awareness and conservation of the environment. Our responsible tourism policy includes actions such as using filtered water rather than bottled water and reducing the usage of plastic items. We also choose responsible hotels & resorts around Kota Kinabalu, Sabah and Borneo at which to offer accommodation, and reduce our ecological footprint at the Dive Downbelow office. As marine enthusiasts we have dedicated part of DiveDownBelow.com to the creatures we adore. The Marine Biology section is presented as a field guide with creature information for divers and non-divers alike, to enjoy. The Project AWARE Foundation supports a grown number of divers who, through advocacy and action, are committed to protecting the oceans. For Project AWARE to continue supporting environmental education through divers and dive centers, they need a constant stream of funding, which, amongst other channels, is obtained from Project AWARE branded certification cards. In July 2011 we illustrated our commitment to supporting this cause, when we pre-purchased 500 certification cards, constituting a contribution to Project AWARE of AU$ 5,000, because we believe divers care about the environment and want to help preserve the resources they enjoy. Because of that, all of our students received an upgraded qualification card with the Project AWARE logo indicating that they too care for the ocean and are ambassadors of the ocean. Since July 2011 we have continued this initiative so by completing a PADI dive course with us, you are not only supporting Downbelow but also supporting the environment. Aside from creating awareness, Downbelow also regularly conduct Project AWARE beach and reef clean-up events in Kota Kinabalu, and incorporate environmental education in all our group programs. As affirmation that we’re on the right track, our achievements and effort towards environmental conservation were recognized by PADI Project AWARE last year. Each year PADI Project AWARE recognises dive centres that go the extra mile in diver education and promotes awareness of our coastlines and underwater environment. In 2010 Dive Downbelow were noticed and recognised as such a dive centre when we became the proud recipient of the Project AWARE Conservation Award – Asia Pacific 2010. In February 2012 we became the first dive centre in Malaysia to earn the PADI Green Star Award™.The PADI Green Star Award™ is a program, initiated by PADI in conjunction with Project AWARE, that helps dive centres identify areas of their business where better efficiencies can reduce their environmental impact. On the other hand, it also helps divers identify the dive centres who care enough about the environment to make a difference. 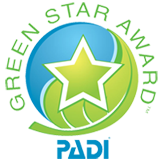 Downbelow is proud to be associated with the PADI Green Star Award™ and continues to strive to find new ways of further reducing our environmental footprint for the good of our oceans and to the benefit of our divers. We remain committed as ever championing the natural environment, which we love so much. Below is a snippet of our 5 most recent PADI Project AWARE events, but do subscribe to our Blog to see what else we’ve been up to recently, relating to diving and other activities. For more information about any of our conservation activities, PADI Project AWARE programs or how to get involved as an individual or group, please do contact Downbelow. In the meantime, flip through the photo albums of our previous events. You can visit our Contact Us page to find out how to phone, email or visit our offices located in KK Times Square in Kota Kinabalu, Sabah.